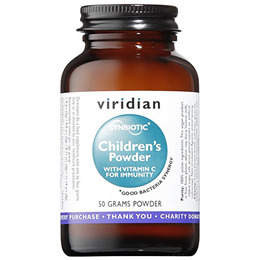 Viridian Childrens Synbiotic Powder - High potency multi-strain flora for children aged 1 to 14 years. Comes with a scoop inside the bottle. This product has been specially designed for the healthy development of the infant intestinal microbiota and immune system/function. It contains a combination of four strains – Lactobacillus acidophilus, Lactobacillus casei together with Bifidobacterium lactis (formerly known as B. infantis) and Bifidobacterium bifidum at a dose of 2 billion organisms per gram of powder supplement. This symbiotic combination of appropriate healthy bacteria is researched and formulated for the use of children between the ages of 1-14 years. Acidophilus provides lactobacillus acidophilus to maintain a healthy balance of intestinal microflora. Synbiotic means a synergistic combination of probiotics (healthy bacteria) and pre-biotics (food provided to support the good bacteria). This combination of appropriate healthy bacteria is researched and formulated for the use of children between the ages of 1-14 years. Inulin acts as a prebiotic (promotes the proliferation of good bacteria) and when brought together with the probiotic species shown above, creates a synbiotic formula. Inulin has also been noted to promote short-chain fatty acids (SCFAs) known to support liver function. *Full spectrum prebiotic oligosaccharide and plant-derived inulin. Lactobacillus acidophilus NCIMB 30157, Lactobacillus acidophilus NCIMB 30156, Bifidobacterium lactis NCIMB 30153, Bifidobacterium bifidum NCIMB 30153, Vitamin C (as calcium ascorbate), Prebiotic FS2-60*. As a food supplement, take one to four grams daily or as directed by your healthcare practitioner. Comes with a scoop inside the bottle. Below are reviews of Viridian Synbiotic - Children`s Powder - Vitamin C -50g by bodykind customers. If you have tried this product we'd love to hear what you think so please leave a review. Excellent product .... Good variety of bacteria & strength ... 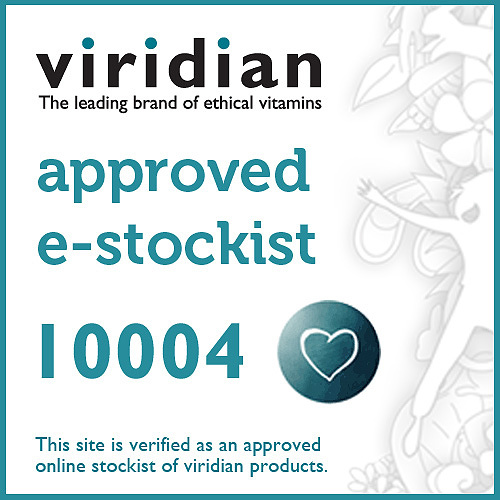 In an easy to sprinkle powder form .... Have tried other brands but would recommend using Viridian ..... & good price from bodykind.